Above you will find a random selection of current discounted properties in your suburb and postcode. 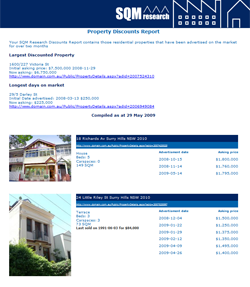 Properties featured have been listed for two months or more. Plus links to the full report containing more detail. Descriptive detail including property type, number of bedrooms, land size(houses only), car spaces and photo.